Sun Xi Kun 孫 錫 堃 (1883-1952) was one of the few disciples of Cheng You Long (also called Cheng Hai Ting), the oldest son of Cheng Ting Hua, who purportedly did not like to teach or demonstrate his art. Sun’s book Ba Gua Quan Zhen Chuan (Genuine Transmission of Ba Gua Zhang) is one of the few records of Chen You Long’s method. 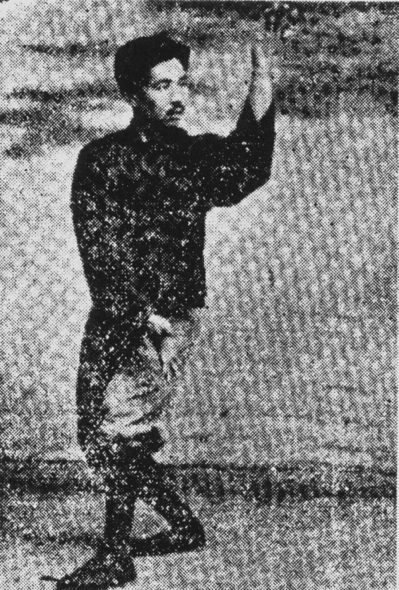 In addition to Ba Gua Zhang, Sun Xi Kun also studied Xing Yi Quan and Tai Ji Quan. He was also a student of Daoism, and established the Morality and Martial Arts Society in Tianjin. Sun Xi Kun moved South during WWII, eventually traveling to Hong Kong and later to Taiwan, where he lived and taught until his death. In the school of Ba Gua Zhang, all things are related to the palm methods. If one is not instructed by a good teacher, its mystery can not be figured out. The internal organs will be injured through the application of awkward force. Students of the martial arts must be aware of this. When beginning training, it is advisable to train slowly, the slower the better, from slow speed to fast speed. After a long time, qi sinks into the Dantian, and hands and feet will be harmonized; the awkward force will be gone, without stagnation or dispersion, slowness and interruption. The waist is like a wheel and qi is like a wheel. To change the posture is like moving clouds and to walk with the step is like flowing water. The false and true weighting of the two feet should be distinctive. By pulling the body and changing the shadow, the body turns like a frightened goose. The mysteries are endless when the changes take place according to the situation. For practitioners of the martial arts, no matter what style of art they train, the waist should be taken as the general root. The victory is not won by the floating force and is all related to the energy of the Dantian. When one fist goes out, it is necessary to be natural, with the true hidden in the false and the false hidden in the true. The true means the striking hand and the false means the changing hand. To extend the hand is like sticking out the tongue, and to hit someone is like kissing them, all. The mysteries of the striking methods are in accordance with the applications of Ba Gua Zhang. They can be divided into Tui (Push), Tuo (Uphold), Dai (Lead) and Ling (Guide), Ban (Remove), Kou (Button together), Pi (Chop), Jin (Advance), Zhua (Grab), Na (Seize), Gou (Hook), Da (Strike), Feng (Seal), Bi (Close), Shan (Dodge) and Zhan (Spread out). When one is able to advance, one must be able to retreat. While able to transform, it is necessary to be able to generate. One must be firm but not stagnant, gentle but not dispersing, tranquil as Mt. Taishan and yet move like a swimming dragon – in a spiral force, endlessly, with the changes everywhere within the circles of the circles. These are the essentials of Ba Gua Zhang and mysteries of the martial arts. It is said in the boxing manuscripts that in training martial arts, pre-heaven qi should be trained evenly, and the combination of firmness and gentleness should be carefully sought. If the methods of Ba Gua Zhang are understood, there is no need to worry about a thousand force from a fierce man. One who knows his own strength and that of the enemy is invincible in battle. Practitioners of the martial arts should focus on the hand, eye, body work (Shen Fa) and steps (footwork – Bu Fa) externally, and cultivate the mind and spirit internally. The heart is the marshal. The eye is the scout. The foot is a battle steed. The hand is the soldier. Therefore, one must be sharp in the eyes, follow with the body, be stable in the heart and be precise in the hand. The eye is smart in its ability to detect. The hand is nimble in its pulling and removing ability. The foot is skillful in its fast speed. The spirit has the ability to lead. When the energy is interrupted, the intention is not interrupted. When the intention is interrupted, the spirit is linked. To extend the palm is like a bull tongue. To change the palm is like a shuttle. The key to the boxing art is to take the person from his root. This is the theory of the boxing art. The training method of this boxing art is divided into three – the upper, middle and lower basins. Once three basins are skillful, internal energy can be automatically understood. Afterwards, no matter what weapons are trained – long, or short, or single, or double – all are transformed from it.